This web site is provided by the Ontario Catholic School Trustees’ Association, conditional on your acceptance of the terms and conditions of use set forth below. By accessing, using and/or downloading materials from this site, you agree to accept and abide by these terms and conditions for each use and each visit to this site. If you do not agree to the Policy, Terms and Conditions, you should not access this site. The Ontario Catholic School Trustees’ Association has the sole right to add, change or remove any part of the policy, terms and conditions. If you continue to use this site, you will be considered to have accepted all of the policy, terms and conditions. The protection of confidential member information is of paramount importance to the Ontario Catholic School Trustees’ Association. In compliance with the Protection of Privacy Electronic Documents Act, the Ontario Catholic School Trustees’ Association has an obligation to maintain the security of member records. Individual members may access their own information in their private account in the Members’ Area of the web site. use or attempt to use another’s account, password, system or service without prior written authorization from the Catholic Principals’ Council of Ontario. attempt to gain unauthorized access to the restricted areas of this site. This site is protected by copyright. You may reproduce material from this site without permission provided that you do not sell or modify it and that you credit the Ontario Catholic School Trustees’ Association and test.ocsta.on.ca. The names, graphics and logos on this site are the exclusive property of the Ontario Catholic School Trustees’ Association and may not be copied, imitated or used in whole or in part without the prior written consent of the Executive Officers of this Association. Certain links on this site may take you to other web sites. 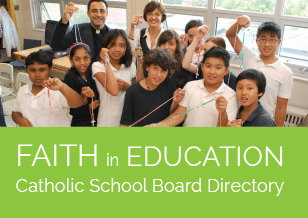 The Ontario Catholic School Trustees’ Association provides these links only as a convenience. If you use linked sites, you will leave this site. If you decide to visit any linked site, you do so at your own risk. While we make every effort to ensure that the material on this site is up to date and accurate, the Ontario Catholic School Trustees’ Association cannot guarantee that our web site will be error-free. You acknowledge that your use or reliance on the site or materials is at your own risk. All information on this web site is available in English only. However, users should be aware that some information from external sources is available only in the language in which it was provided.